Creates a customizable letter and quote. The Document uses a XML master file to allow data to be driven into it, and then uses a transform script to create a HTML file for viewing. Variables - Stored in a category with the name given to the Document. Calculation Table - With the name given to the Document. The Quotation Document Template will create a HTML file which is viewable in a web browser. In DriveWorks Administrator open the Project the Document is to be applied and go to Stage4: Output Rules then Documents - Files and scroll down to Template. 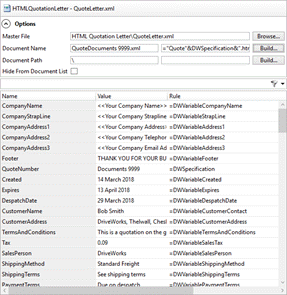 Choose the HTML Quotation Letter from the Document Templates list on the Add Document wizard. By default the rule given is <Document Name> & DWSpecification & ".html"
Hide From Document List - Check to not display the new Document in the Documents List for a Specification. The list of parameters can be filtered by using the filter box above the list. The images used in the Document can be modified by replacing the existing images with your own. This folder will contain the file QuoteLetter.xml and a sub folder named Content. Replace these images with your own to allow them to be used in each Document created. More advanced customizations can be done if you are familiar with XML and XSLT by modifying the corresponding files in the locations described above.